As Jesus and his disciples left Jericho one day, they came near a blind man named Bartimæus, who was begging on the side of the road. There were many people, but when Bartimaeus learned that Jesus was among them, he became excited and called out to him. The people around him told him to be quiet. Jesus was important and Bartimaeus only a beggar. They did not believe it was appropriate for a beggar to bothers someone as special as Jesus. Jesus heard his calls and stopped. He asked for Bartimaeus to be brought to him. Now that he actually had the Savior’s attention, he became nervous and wasn’t sure about going. The apostles kindly reassured him there was nothing to be afraid of and he should just rise and go to the Savior. Bartimaeus did so and approached Jesus, probably very nervous. Jesus spoke to him with great respect, something not often accorded blind men and beggars. He asked the man what he could do for him. Bartimaeus, no doubt having heard of the many miracles Jesus had performed and perhaps often dreaming of receiving such a miracle himself, asked for his sight. Jesus told him that his faith had made him whole. Immediately, the man could see again and he began to follow Jesus. While it is usually the miracle that gets the attention in this story, perhaps the greatest lesson is found in the way Jesus treated this man. Few, even today, treat beggars or others we consider beneath us, with respect. Many will blame the person who is struggling for his own problems and therefore find no need to help that person. In the Book of Mormon, a king named Benjamin addressed this issue by reminding his people that we are all beggars, in that we depend on God for everything we have. Therefore, we have no right to look down on others who are in need. Nor do we have a right to judge a person and decide they don’t deserve our help because they caused their own problems, in our estimation. Jesus, in full view of all those around him, spoke to Bartimaeus as if he were a very important person. He didn’t ask what Bartimaeus wanted. He asked what He could do for the man. He, the Savior of the world, stood prepared to serve this person many ignored every day. When Bartimaeus asked for his sight, Jesus responded a bit differently than He did with some others who had asked for similar things. Instead of having the man perform some special deed, He simply told the man he had been healed by his own faith. What impact might that have had on those who watched? A man who seemed beneath their notice, and certainly beneath the Savior’s notice, had a spiritual gift so strong his own faith could heal him. How might people have looked at Bartemaeus after that day? How might they have looked at others who seemed unimportant or even bad? Did they find themselves wondering if there was more to that person than might seem obvious at first? Following the example of Jesus Christ means treating each person you meet, even those you consider unimportant, as a child of God. 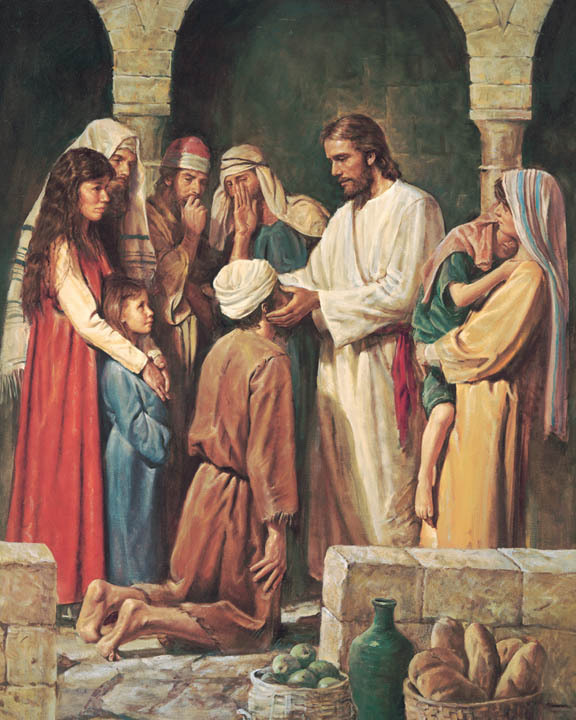 Read about Jesus healing Bartamaeus in the New Testament.